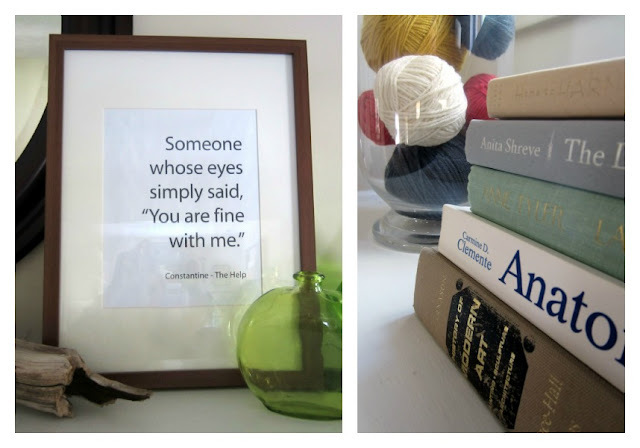 Aptly named, this room sees it all. From rough-housing, to naps on the sofa, to friends laughing. Our living room has three areas: the entry area, the study, and the main sitting area. This first photo is what you see when you come in our front door. 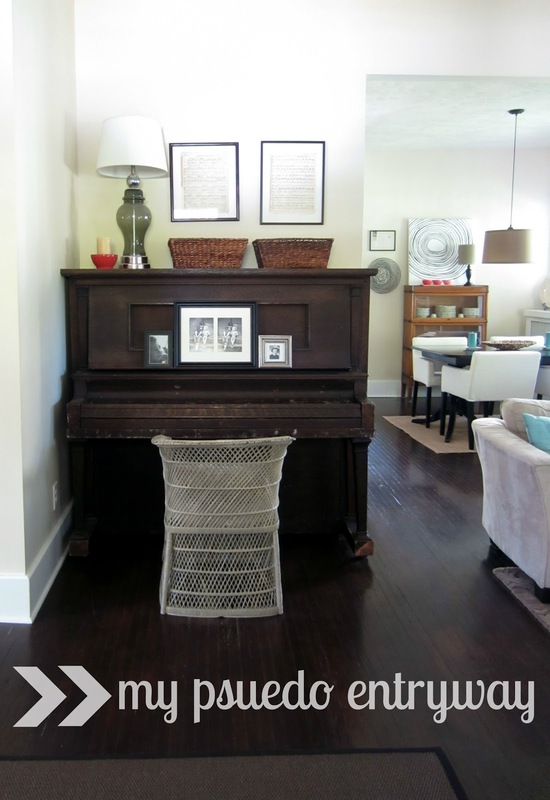 The rug is the natural fiber kind with a rubbery backing so wet shoes can come in and the floors are still safe. Directly to your left, we have a dresser (pictured below) that holds mail, hats, scarfs, gloves and the kids shoes, since we go shoe-free in the house. start to feel stared at. 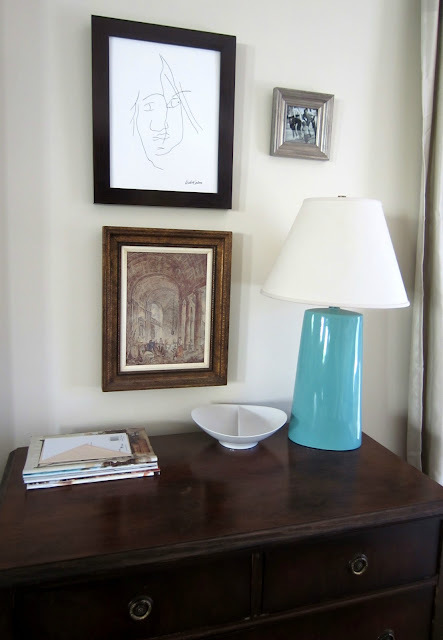 And as a general rule, hang art six inches above the top of your table. The fireplace doesn't function right now, so I hot glued slices of wood to black foam core for my inset. (If you'd like to make one, you'll need to brace it with 2x4's on the back side.) I've mentioned before that decor should be personal, telling the occupants story. An example in this room is the driftwood on the mantle. We brought it back from a camp in Kansas that has a beach. I love it's color and shape and price, but mostly that it reminds us of happy times. 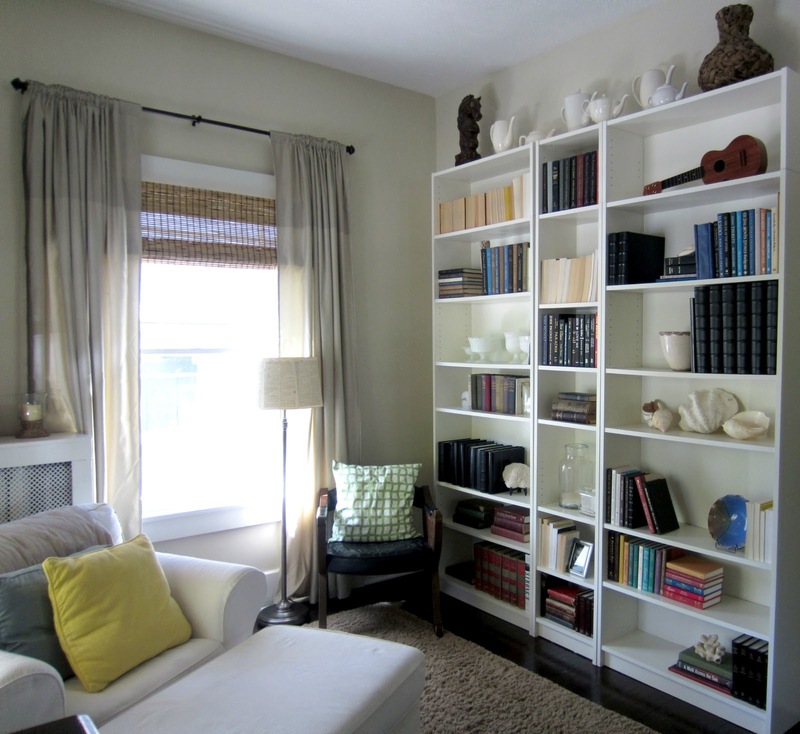 An inexpensive way to add color to a room or boost a lamp that's too short is books. I pull from our library mostly, but in a pinch, I've peeked inside jacket covers at Goodwill. A bit more expensive, but effective way to bring in color is buying yarn and wrapping anything free - I used old nerf balls and extra golf balls, but yarn adds up surprisingly. The framed quote is from The Help and it's something I want my family to know deep inside, all the time. Even if it's my job to encourage them to go someplace better in their journeys, I want them to know they're always fine with me. Life is full of limitations that crimp your style, Stephen! I've had my share too, but living in this house - it's like a girl can hardly go wrong. : ) Also, life has gotten considerably easier (clutter and mess-wise) since becoming a minimalist. I totally recommend it and plan to blog about it someday. Nice looking Living Room. It certainly gives me ideas. Simplistic is better and less cluttered. It is real refreshing thanks for sharing. I find simple more peaceful to be in. And easier to dust! ;) Thanks for reading!